From the moment I laid eyes on this chair I knew it was this month’s chair of the month. 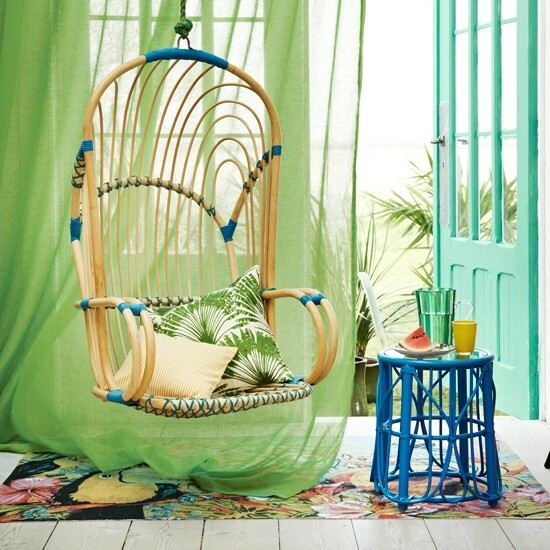 Every little last detail of this chair screams tropical. From the bamboo material to the blue and green accents that remind you of the sea. As if that was not enough, you see that it is a hanging chair. It is the perfect place to swing in the breeze while enjoying a good book. We found this image on the House to Home website. We love the tips they share to add the sheer fabric and a bamboo stool in a bright pop of complementing color to add to the feeling of the tropics. We do not currently have the source of this chair, but we fell in love with it and had to make it this month’s Chair of the Month (it was too perfect not to). We have however contacted the magazine to find the source and will update this post with the information as soon as we are able to obtain it.